The 2004 Atlantic hurricane season was a very deadly, destructive, and hyperactive Atlantic hurricane season, with over 3,200 deaths and more than $61 billion (2004 USD) in damage. More than half of the 16 tropical cyclones brushed or struck the United States. Due to the development of a Modoki El Niño – a rare type of El Niño in which unfavorable conditions are produced over the eastern Pacific instead of the Atlantic basin due to warmer sea surface temperatures farther west along the equatorial Pacific – activity was above average. The season officially began on June 1 and ended on November 30, though the season's last storm, Otto, dissipated on December 3, extending the season beyond its traditional boundaries. The first storm, Alex, developed offshore of the Southeastern United States on July 31, one of the latest dates on record to see the formation of the first system in an Atlantic hurricane season. 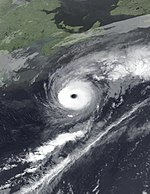 It brushed the Carolinas and the Mid-Atlantic, causing one death and $7.5 million (2004 USD) in damage. [nb 1] Several storms caused only minor damage, including tropical storms Bonnie, Earl, Hermine, and Matthew. In addition, hurricanes Danielle, Karl, and Lisa, Tropical Depression Ten, Subtropical Storm Nicole and Tropical Storm Otto had no effect on land while tropical cyclones. There are four notable storms: Hurricane Charley, that made landfall in Florida as a Category 4 hurricane on the Saffir–Simpson hurricane wind scale (SSHWS), causing $16 billion in damage in the United States alone. Later in August, Hurricane Frances struck the Bahamas and Florida, causing at least 49 deaths and $10.1 billion in damage. 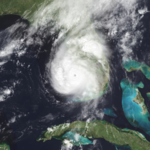 The costliest and most intense storm was Hurricane Ivan. It was a Category 5 hurricane that devastated multiple countries adjacent to the Caribbean Sea, before entering the Gulf of Mexico and causing catastrophic damage on the Gulf Coast of the United States, especially in the states of Alabama and Florida. Throughout the countries it passed through, Ivan caused 129 fatalities and over $26.1 billion in damage. The deadliest storm was Hurricane Jeanne. In Haiti, torrential rainfall in the mountainous areas resulted in mudslides and severe flooding, causing at least 3,006 fatalities. Jeanne also struck Florida, inflicting extensive destruction. Overall, the storm caused at least $7.94 billion in damage and 3,042 deaths, ranking it as one of the deadliest Atlantic hurricanes in history. Collectively, the storms of this season caused at least 3,270 deaths and about $61.2 billion in damage, making it the costliest Atlantic hurricane season at the time, until surpassed by the following year, 2012, and then 2017. With six hurricanes reaching at least Category 3 intensity, 2004 also had the most major hurricanes since 1996. [nb 2] However, that record would also be surpassed in 2005, with seven major hurricanes that year. In the spring of 2005, four names were retired: Charley, Frances, Ivan, and Jeanne. This tied the then-record most names retired with 1955, 1995, and 2017, while five were retired in 2005. 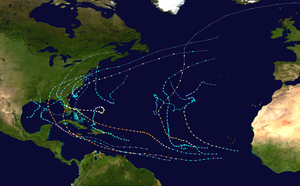 Since 1984, forecasts of hurricane activity have been issued before each hurricane season by noted hurricane expert Dr. William M. Gray and his associates at Colorado State University (CSU), and separately by forecasters with the U.S. Government's National Oceanic and Atmospheric Administration (NOAA). According to CSU, the average season between 1950 and 2000 had 9.6 tropical storms, 5.9 hurricanes, and 2.3 major hurricanes, which are Category 3 or higher on the Saffir-Simpson hurricane wind scale. A normal season, as defined by NOAA, has 12.1 named storms, of which 6.4 reach hurricane strength and 2.7 become major hurricanes. CSU released its first prediction on December 5, 2003, which projected an above average season, with 13 named storms, seven hurricanes, and three major hurricanes. This forecast was adjusted upward slightly on April 2. On May 17, prior to the start of the season, NOAA forecasters predicted a 50% probability of activity above the normal range, with twelve to fifteen tropical storms, six to eight of those becoming hurricanes, and two to four those hurricanes reaching major intensity. Dr. Gray released a prediction on May 28 that was similar, with 14 named storms, eight reaching hurricane strength, and three becoming major hurricanes. After the season began, Dr. Gray announced he had revised his predictions slightly downwards on August 6, citing mild El Niño conditions. His new forecast was thirteen named storms, seven hurricanes, and three reaching major hurricane intensity. On August 10, NOAA released an updated prediction as well, with a 90% probability of above-to-near normal activity, but the same number of storms forecast. CSU issued another forecast on September 3, indicating sixteen tropical storms, eight hurricanes, and five major hurricanes. The season ended up with sixteen tropical depressions, fifteen named storms, nine hurricanes, and six major hurricanes, which matched CSU's final prediction on October 1. The Atlantic hurricane season officially began on June 1, 2004. However, the first system, Hurricane Alex, did not develop until July 31. It was an above average season in which 16 tropical cyclones formed. All but one tropical depression attained tropical storm status, and nine of these became hurricanes. Six hurricanes further intensified into major hurricanes. Due to a Modoki El Niño – a rare type of El Niño in which unfavorable conditions are produced over the eastern Pacific instead of the Atlantic basin due to warmer sea surface temperatures farther west along the equatorial Pacific – activity was above average. Five hurricanes and three tropical storms made landfall during the season and caused 3,270 deaths and about $60.9 billion in damage. Additionally, Hurricanes Alex and Tropical Storm Earl also caused losses and fatalities, though neither made landfall. The season officially ended on November 30, 2004. Tropical cyclogenesis began at the end of July, with the development of Hurricane Alex on July 31. However, it did not become a named storm until the following day, which was the fifth-latest start since the 1952 season. August was an unusually active month, with eight named storms, including Alex, Bonnie, Charley, Danielle, Earl, Frances, Gaston, and Hermine. This broke the record for the most named storms in the month of August set in 1933 and 1995. This new record was tied in 2012. On average, there are only three tropical storms and one to two hurricanes in August. Of the eight systems that month, five became hurricanes and three strengthened further into major hurricanes. A total of five tropical cyclones developed in September, including the most intense system of the season, Hurricane Ivan. Activity decreased further in October, with the formation of only two systems, Tropical Storm Matthew and Subtropical Storm Nicole. The season then went dormant for over a month and a half, until Tropical Storm Otto developed on November 29. Otto was the final tropical cyclone of the season and degenerated into a remnant low pressure on December 3. The 2004 season was very deadly, with about 3,270 fatalities overall. Nearly all of the deaths were reported in Haiti following the floods and mudslides caused by Tropical Storm Jeanne. The other tropical cyclones that caused fatalities include Hurricane Alex, Charley, Frances, Gaston, and Ivan, and Tropical Storms Bonnie and Earl. Because four out of the six major hurricanes made several landfalls, the season was also extremely damaging, with losses estimated at about $60.9 billion, over half of which was caused by Hurricanes Charley and Ivan. A few other tropical cyclones caused light to moderate damage, including Hurricanes Alex and Gaston and Tropical Storms Bonnie and Matthew. In addition to the 16 tropical cyclones of the season, a tropical low in May brought torrential flooding to Haiti and the Dominican Republic, killing 2,000 people and causing extensive damage. Although the system was not officially classified as a tropical storm, it did have a circulation with loosely organized convection, resembling a subtropical cyclone. The 2004 season had numerous unusual occurrences and set many records. However, most of them were surpassed by the following year. With six hurricanes reaching at least Category 3 intensity, 2004 also had the most major hurricanes since 1996, a record which would be surpassed in 2005. 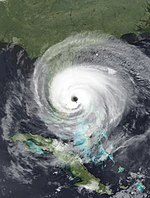 Florida was directly impacted by four major hurricanes during the season – Hurricane Charley, Frances, Ivan, and Jeanne. This was the first time four tropical cyclones produced hurricane-force winds in one state during a single season since four hurricanes made landfall in Texas in 1886. There were many other hurricanes in the season that were individually unusual. Hurricane Alex was the strongest hurricane on record to intensify north of 38°N latitude. Hurricane Ivan was the most unusual storm of the season. 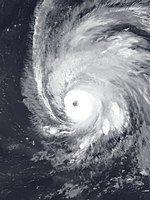 Ivan became the southernmost Category 4 hurricane on record in the Atlantic basin, as well as the first major hurricane in the Atlantic on record to form as low as 10°N latitude. A 91 ft (28 m) wave, possibly the largest ever recorded, was attributed to Ivan; this wave may have been as high as 131 ft (40 m). Additionally, hurricanes Charley and Ivan ranked as the third and second costliest hurricanes in the United States at the time, respectively, behind only Hurricane Andrew. With $60.9 billion in damage, this was the costliest season at the time, until the following year. The season's activity was reflected with an accumulated cyclone energy (ACE) rating of 227, one of the highest values on record in the Atlantic basin. ACE is, broadly speaking, a measure of the power of the hurricane multiplied by the length of time it existed, so storms that last a long time, as well as particularly strong hurricanes, have high ACEs. It is only calculated for full advisories on tropical systems at or exceeding 39 mph (63 km/h), which is tropical storm strength. The interaction between a trough and tropical wave resulted in the development of a tropical depression on July 31, while centered about 200 mi (320 km) east of Jacksonville, Florida. After initially being poorly organized, the depression strengthened into Tropical Storm Alex late on August 1. The storm tracked northeastward and became a hurricane on August 3. As Alex moved out to sea, it intensified into a Category 3 hurricane and peaked with winds of 120 mph (195 km/h). Alex reached major hurricane status second farthest north in the Atlantic, after Hurricane Ellen in 1973. Eventually, Alex weakened due to cooler sea surface temperatures. The hurricane fell to tropical storm intensity around 12:00 UTC on August 6. 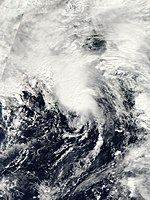 Six hours later, it became extratropical while located about 955 mi (1,540 km) east of Cape Race, Newfoundland, and was soon absorbed by a large extratropical cyclone. Rough seas and a storm surge up to 6 ft (1.8 m) on the Outer Banks of North Carolina caused minor beach erosion and washed out portions of a highway in Cape Fear. A man drowned near Nags Head due to these conditions. Strong winds also pelted the area, with sustained winds reaching 77 mph (124 km/h) and gusts up to 105 mph (169 km/h) in Hatteras. As a result, 10,000 buildings and houses were left without electricity. The combination of strong winds and the storm surge damaged more than 100 buildings and houses. At Ocracoke, coastal flooding was considered the worst since Hurricane Gloria in 1985. Additionally, rainfall up to 7.55 in (192 mm) on the Outer Banks flooded nearly 500 cars. Damage in North Carolina reached about $7.5 million. In Rehoboth Beach, Delaware, three people were injured by rip currents, while five others were hospitalized in New Jersey. A tropical wave developed into Tropical Depression Two on August 3, while located about 315 mi (505 km) east of Barbados. The depression crossed the Lesser Antilles on August 4, before degenerating back into a tropical wave. The remnants traversed the Caribbean Sea, and re-developed into Tropical Depression Two on August 8. The depression strengthened further upon reaching the Gulf of Mexico and was upgraded to Tropical Storm Bonnie on August 9. A break in a mid-level ridge re-curved Bonnie northward on August 10 and then northeastward on August 11. Later that day, the storm peaked with winds of 65 mph (100 km/h), before wind shear began weakening it. At 14:00 UTC on August 12, Bonnie made landfall near Apalachicola, Florida with winds of 45 mph (75 km/h). The storm rapidly weakened inland and degenerated as a remnant low offshore of New Jersey on August 14. In the Lesser Antilles, the storm brought light winds and mostly localized flooding to Saint Vincent and the Grenadines. The regenerated system brought light rainfall to the Yucatan Peninsula. In North Florida, scattered power outages were reported, and rainfall and storm surge flooded roads, especially in Taylor County. A tornado in Jacksonville damaged several businesses and homes. Tornadoes were also reported in The Carolinas, and Virginia, with one in North Carolina destroying 17 homes and impacting 59 others. It also caused three deaths and $1.27 million in damage. In Greenville County, South Carolina, a few roads were washed out, while portions of U.S. Route 501 were inundated with 1 ft (0.30 m) of water. Minor flooding also occurred in Mid-Atlantic and New England. In Atlantic Canada, basement and road flooding was reported, especially in Edmundston, New Brunswick. Slick roads caused one death in that area. A tropical wave developed into Tropical Depression Three on August 9 to the south-southeast of Barbados. Early on August 10, it was upgraded to Tropical Storm Charley, before reaching hurricane intensity south of Jamaica on August 11. Charley continued to strengthen after curving northwestward and was a 120 mph (195 km/h) Category 3 hurricane when it made landfall near Alquízar, Cuba on August 13. After emerging into the Straits of Florida, Charley weakened to a Category 2 hurricane. However, the storm abruptly strengthened into a Category 4 hurricane later on August 13, with winds peaking at 150 mph (240 km/h). At 19:45 UTC on August 13, Charley made landfall at Cayo Costa, Florida, followed by another landfall in Punta Gorda about an hour later. Charley rapidly weakened over Florida, falling to Category 1 by early on August 14. Later that day, the storm emerged into the Atlantic, before making two more landfalls in Cape Romain and Myrtle Beach, South Carolina as a minimal hurricane. Late on August 14, Charley weakened to a tropical storm over southeastern North Carolina, shortly before becoming extratropical near Virginia Beach, Virginia. The storm brought rainfall and strong winds to the island of Jamaica. In Westmoreland Parish, flooding inundated several homes and damaged roadways. Winds in the parish caused a large tree to fall on a house, resulting in significant damage to the home. In Kingston, high winds damaged power lines and homes. Widespread power outages occurred due to numerous downed trees and power lines. The storm left $4.1 million in damage and one fatality in Jamaica. Winds up to 118 mph (190 km/h) in Cuba left all of Pinar del Río Province and more than 50% of La Habana Province without electricity for several days. At least 70,290 homes and about 3,000 agricultural buildings were either damaged or destroyed. Roughly 95% of sugar cane, bean, and banana crops were ruined. There were four deaths and $923 million in damage. Impact in Florida was extreme: strong winds caused 2 million power outages and destroyed more than 2,439 structures and impacted over 26,749 others. Charley caused 24 deaths and 792 injuries. Agricultural losses were heavy, especially to oranges. Damage to agriculture totaled about $2.2 billion. In South Carolina, 2,231 houses were damaged, with 2,317 of those severely damaged and 40 were destroyed. Approximately 141,000 people were left without electricity. Port Charlotte was left without electricity for 13 days. Winds up to 85 mph (137 km/h) in North Carolina downed trees and power lines, and left 65,000 homes without power. Charley destroyed 40 houses and damaged 2,231 other homes in the state. Throughout the United States, the storm caused $16 billion in damage, with nearly of all of it in Florida. The remnants of Charley produced light rainfall in Nova Scotia and Newfoundland. A tropical wave developed into Tropical Depression Four while south-southeast of Cape Verde on August 13. Although sea surface temperatures were only marginally warm, the depression strengthened into Tropical Storm Danielle early on August 14. Further intensification occurred and by early on August 15, Danielle reached hurricane status. The storm deepened significantly over the next 24 hours and became a Category 2 hurricane. 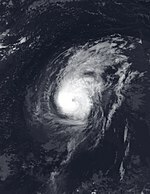 Later on August 16, Danielle peaked as strong Category 2 hurricane with winds of 110 mph (175 km/h) and a minimum barometric pressure of 964 mbar (28.5 inHg). At the time of peak intensity on August 16, Danielle was heading northward to north-northwestward because of a subtropical ridge. Shortly thereafter, southwesterly vertical shear began increasing, causing the hurricane to weaken. Mid-level flow associated with a diffluent trough caused Danielle to move northeastward on August 18. Later that day Danielle deteriorated to a Category 1 hurricane, hours before being downgraded to a tropical storm. On August 19, Danielle became nearly stationary and moved erratically while southwest of the Azores. Eventually, the storm curved west-southwestward and weakened to a tropical depression on August 20. About 24 hours later, Danielle degenerated into a remnant low pressure area. The remnant low moved westward and then to the north-northwest, before dissipating about 795 mi (1,280 km) west-southwest of the westernmost islands of the Azores. By August 13, a tropical wave developed into Tropical Depression Five while located about 1,150 mi (1,850 km) east of the Lesser Antilles. The depression headed westward between 21 and 29 mph (34 and 47 km/h) due to a strong subtropical ridge located to its north. After developing banding features and an increase in Dvorak intensity estimates, the depression was upgraded to Tropical Storm Earl at 18:00 UTC on August 14. The storm strengthened slightly further and on the following day, it reached maximum sustained winds of 50 mph (85 km/h). Later on August 15, Earl crossed the Windward Islands and passed just south of Grenada. Although Earl appeared well-organized, it unexpectedly degenerated into a tropical wave on August 16, after a reconnaissance aircraft reported no closed circulation. The remnants eventually reached the Pacific Ocean and developed into Hurricane Frank on August 23. Tropical storm force winds and heavy rainfall in Grenada damaged at least 34 homes and a nursing home and toppled several trees and electrical poles. Damage on other islands was confined to a few impacted homes, moderate crop losses, and widespread power outages, especially in Saint Vincent and the Grenadines and Tobago. One fatality occurred and 19 people were listed as missing. 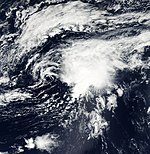 Around 00:00 UTC on August 24, a tropical wave developed into Tropical Depression Six, while located about 755 mi (1,215 km) west-southwest of the southernmost islands of Cape Verde. Moving west-northwestward, the depression strengthened into Tropical Storm Frances later that day. Frances reached hurricane status late on August 25 while curving northwestward. By August 28, the storm reached an initial peak intensity as a Category 4 hurricane with winds of 130 mph (215 km/h). Late the following day, Frances weakened to a Category 3 hurricane during an eyewall replacement cycle. However, by August 31, the storm re-intensified into a Category 4 hurricane and attained its maximum sustained wind speed of 145 mph (230 km/h). Although approaching the Bahamas, wind shear and increasing westerly winds aloft caused Frances to weaken to a Category 3 hurricane late on September 2. At 19:30 UTC on September 2, the system made landfall on San Salvador Island with winds of 125 mph (205 km/h). Early the next day, Frances struck Cat Island while somewhat weaker. The system decelerated and weakened slightly to a Category 2 hurricane before landfall in Eleuthera hours later. By September 4, Frances made another landfall on Grand Bahama with winds of 105 mph (165 km/h). Moving slowly west-northwestward, the hurricane made landfall in Hutchinson Island, Florida at the same intensity, early on September 5. Rapidly weakening, Frances fell to Category 1 intensity around midday and deteriorated to a tropical storm about six hours later. On September 6, the storm emerged into the Gulf of Mexico near New Port Richey, before another landfall at the mouth of the Aucilla River with winds of 65 mph (100 km/h). 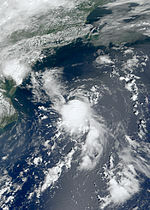 Early on September 7, Frances weakened to a tropical depression over Georgia. By late the next day, the system became extratropical, though the remnants persisted until dissipation over the Gulf of Saint Lawrence on September 11. In the Bahamas, about 75% of residents lost electricity. Between 13 and 17 percent of the non-native Australian pine on San Salvador Island experienced damage, primarily from snapping, though some browning from salt spray was noted. Several feet of water flooded the international airport at Freeport. Insured losses reached about $300 million. Severe damage was also dealt to banana, corn, and pineapple crops. About 4,160 homes received minor damage, while 2,522 houses were rendered uninhabitable or destroyed. About 700 people were left homeless. Additionally, sea walls, schools, bridges, roads, and docks suffered damage. Strong winds brought severe damage to Florida, especially counties along the east coast. Hundreds of homes, mobile homes, and businesses were destroyed in Indian River, Martin, and St. Lucie counties, and damage was inflicted on thousands of other structures there. In the tri-county area alone, damage totaled approximately $4.5 billion. Palm Beach County also suffered particularly severely, with 15,000 houses and 2,400 businesses damaged there. About 4.27 million customers were left without electricity in Florida. Frances and its remnants brought extensive flooding to other states, especially in Georgia, North Carolina, Ohio, and Pennsylvania. The storm spawned 101 tornadoes in the United States, with 45 in South Carolina alone. 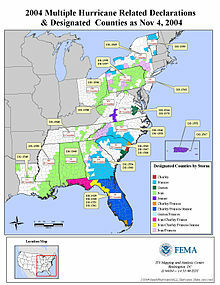 Damage in the United States totaled approximately $9.8 billion, placing Frances among the costliest hurricanes in the country. Overall, the storm caused 49 deaths, two each in the Bahamas and Ohio, eight in Georgia, and thirty-seven in Florida. 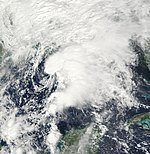 A frontal low pressure area developed into Tropical Depression Seven at 12:00 UTC on August 27, while located about 130 mi (210 km) east-southeast of Charleston, South Carolina. The depression gradually strengthened and was upgraded to Tropical Storm Gaston early on August 28. Initially, Gaston tracked slowly, moving southeastward and then westward, before a developing mid- to upper-level ridge re-curved the storm northwestward. Gaston strengthened and briefly became a hurricane at 120:00 UTC on August 29, although operationally it was thought to have peaked as a strong tropical storm. Two hours later, the storm made landfall near Awendaw, South Carolina with winds of 75 mph (120 km/h). Gaston weakened rapidly inland and was only a tropical depression by early on August 30. 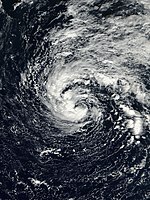 Gaston re-strengthened into a tropical storm while located over eastern Virginia on August 31, just hours before emerging into the Atlantic. Gaston re-intensified slightly further, but became extratropical near Sable Island on September 1. In South Carolina, an unofficial measurement indicated wind gusts up to 82 mph (132 km/h) in South Capers Island, which is near Parris Island. Strong winds destroyed eight homes, damaged more than 3,000 buildings, and left more than 150,000 people without power. Additionally, flash flooding further inland severely damaged or destroyed at least 20 homes in Berkeley County. In North Carolina, widespread street flooding occurred, including inundation of portions of Interstates 40 and 95. Several trees were downed by strong winds, especially in Chatham and Johnston counties. A tornado in Hoke County damaged several homes. Severe flooding occurred in east-central Virginia due to rainfall amounts up to 12.6 in (320 mm). In Chesterfield, Dinwiddie, Hanover, Henrico, and Prince George counties, 350 homes and 230 businesses were damaged or destroyed, and many roads were closed due to high water. In Richmond, more than 120 roads were closed, including a portion of Interstate 95. There were nine fatalities. Throughout the United States, Gaston caused about $130 million in damage. The remnants produced light rainfall in Nova Scotia, Newfoundland, and Sable Island. The frontal zone that spawned Hurricane Gaston developed an area of convection south of Bermuda on August 25. After detaching from the front and developing a circulation, the system became a tropical depression at 18:00 UTC on August 27. It initially remained weak while the convection fluctuated, until intensifying into Tropical Storm Hermine at 12:00 UTC on August 29. Later that day, wind shear exposed the circulation to the north of the convection, though the storm was able to a peak as a 60 mph (95 km/h) tropical storm on August 30. The storm turned northward under the steering currents of a subtropical ridge. Increased wind shear from Gaston weakened Hermine. By late on August 30, the circulation was entirely exposed from the convection. Early on August 31, Hermine made landfall near New Bedford, Massachusetts as a minimal tropical storm. It rapidly weakened while moving northward, and after becoming extratropical, Hermine was absorbed by a frontal zone later that day. The storm brought tropical storm force winds and light rainfall to eastern Massachusetts, reaching about 0.5 in (13 mm) on Cape Cod. The remnants of Hermine tracked across New Brunswick and produced locally heavy rainfall, peaking at about 2.36 in (60 mm). In Moncton, minor basement flooding and street closures were reported. A westward-moving tropical wave developed into a tropical depression on September 2, before becoming Tropical Storm Ivan on the following day. Tracking westward, Ivan gradually strengthened, reaching hurricane intensity on September 5. On September 6, the storm strengthened significantly, becoming a Category 4 hurricane, despite being located at an unusually low latitude. It subsequently weakened, though it reached major hurricane status again the next day. Late on September 7, Ivan passed close to Grenada while heading west-northwestward. Although located near the Netherlands Antilles on September 9, Ivan briefly became a Category 5 hurricane. During the next five days, Ivan fluctuated between a Category 4 and 5 hurricane. The storm passed south of Jamaica on September 11 and then the Cayman Islands on the next day. Although curving northwestward, Ivan brushed western Cuba as a Category 5 hurricane on September 14. Shortly after moving to the west of Cuba on September 14, Ivan entered the Gulf of Mexico. Over the next two days, the storm gradually weakened while tracking north-northwestward and northward. At 06:50 UTC on September 16, Ivan made landfall near Gulf Shores, Alabama with winds of 120 mph (195 km/h). It quickly weakened inland, falling to tropical storm status later that day and tropical depression strength by early on September 17. The storm curved northeastward and eventually reached the Delmarva Peninsula, where it became extratropical on September 18. The remnants of Ivan moved southward and then southwestward, crossing Florida on September 21 and re-entering the Gulf of Mexico later that day. 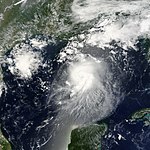 Late on September 22, the remnants regenerated into Ivan in the central Gulf of Mexico as a tropical depression, shortly before re-strengthening into a tropical storm. After reaching winds of 65 mph (100 km/h), wind shear weakened Ivan back to a tropical depression on September 24. Shortly thereafter, Ivan made a final landfall near Holly Beach, Louisiana with winds of 35 mph (55 km/h) and subsequently dissipated hours later. Throughout the Lesser Antilles and in Venezuela, Ivan caused 44 deaths and slightly more than $1.15 billion in losses, with nearly all of the damage and fatalities in Grenada. Although Ivan was passing south of Hispaniola, the outer bands of the storm caused four deaths in the Dominican Republic. In Jamaica, high winds and heavy rainfall left $360 million in damage and killed 17 people. The storm brought strong winds to the Cayman Islands, resulting in two deaths and $3.5 billion in damage. In Cuba, a combination of rainfall, storm surge, and winds resulted in $1.2 billion in damage, but no fatalities. Heavy damage was reported along the Gulf Coast of the United States. Along the waterfront of Escambia and Santa Rosa counties in Florida, nearly every structure was impacted. In the former, 10,000 roofs were damaged or destroyed. About 4,600 homes were demolished in the county. Similar impact occurred in Alabama. Property damage was major along Perdido Bay, Big Lagoon, Bayou Grande, Pensacola Bay and Escambia Bay. A number of homes were completely washed away by the high surge. Further inland, thousands of other houses were damaged or destroyed in many counties. Ivan produced a record tornado outbreak, with at least 119 twisters spawned collectively in nine states. Throughout the United States, the hurricane left 54 fatalities and $20.5 billion in damage. Six deaths were also reported in Atlantic Canada. A tropical wave accompanied with a well-organized area of convection emerged off the western coast of Africa on August 29. Performing a slow curve over the eastern Atlantic, the wave became increasingly less-defined over subsequent days as a result of strong southwesterly wind shear. Following the development of shower and thunderstorm activity near the center, the system acquired enough organization to be deemed a tropical depression at 12:00 UTC on September 7, while positioned about 725 mi (1,165 km) southwest of the southernmost Azores. Hostile environmental conditions caused the depression to remain below tropical storm intensity and subsequently degenerate into a remnant low by 12:00 UTC on September 9 after the center decoupled from the remainder of the convective activity. The low-level circulation persisted near the Azores until dissipating the following day. Tropical Depression Eleven developed from a tropical wave at 18:00 UTC on September 13, while located about 70 mi (110 km) east-southeast of Guadeloupe. After crossing the island while moving west-northwestward, the depression intensified into Tropical Storm Jeanne around midday on September 14. It strengthened further in the Caribbean Sea, before making landfall near Guayama, Puerto Rico with winds of 70 mph (110 km/h) at 16:00 UTC the following day. Hours later, Jeanne emerged into the Mona Passage and resumed deepening, becoming at Category 1 hurricane at midday on September 16. Around the time, the hurricane made another landfall at the eastern tip of Dominican Republic with winds of 80 mph (130 km/h). 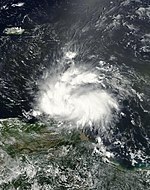 By early on September 17, Jeanne weakened to a tropical storm due to its slow movement over the rough terrain of Hispaniola, and briefly fell to tropical depression intensity at 18:00 UTC. After re-emerging into the Atlantic, the storm then moved generally northward. After the system passed between the eastern Bahamas and Turks and Caicos Islands on September 18, slow re-intensification occurred. 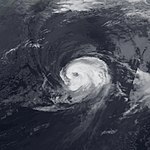 Late on September 20, Jeanne again became a Category 1 hurricane; around that time, it began to execute an anti-cyclonic loop. The storm moved eastward, before a trough of low pressure caused Jeanne to curve southeastward. Early on September 22, the system strengthened into a Category 2 hurricane. A deep-layer ridge slowly curved Jeanne to the west by the following day, around the time it weakened to a Category 1 hurricane due to upwelled waters. However, the storm began re-intensifying on September 24, becoming a Category 2 hurricane again that day and a Category 3 by September 25. At 14:00 UTC on the latter, Jeanne struck the Abaco Islands in the Bahamas with winds of 115 mph (185 km/h). The hurricane strengthened slightly further, peaking with maximum sustained winds of 120 mph (195 km/h). Jeanne made its final landfall on Hutchinson Island, Florida at the same time around 04:00 UTC on September 26. It quickly weakened after moving inland and fell to tropical storm intensity only 14 hours later. Curving northward, Jeanne decayed to a tropical depression over Georgia late on September 27. Jeanne turned northeastward and became extratropical over Virginia after about 24 hours. The remnants briefly re-strengthened after moving offshore the Delmarva Peninsula, but dissipated late on September 29. In Guadeloupe, rainfall amounts up to 11.81 in (300 mm) caused flooding and mudslides throughout the island. Many roads and bridges were inundated or washed out. About 470 homes were damaged or destroyed. Similar impact was reported in Puerto Rico, with heavy precipitation causing flooding and mudslides. There was also heavy damage to crops, schools, houses, and businesses. Strong wind gusts left 70% of the island without power. Jeanne resulted in $169.9 million in damage and eight deaths. In Dominican Republic, major flooding was reported, with rivers overflowing, bridges collapsing, roads cut off, damage to agriculture, and mudslides. Strong winds disrupted telephone services and caused power outages. Overall, hundreds of people became homeless and there was 23 deaths and $270 million in damage. Up to 13 in (330 mm) of rain fell on the mountainous region of Haiti, causing extreme flooding and mudslides, especially in the Gonaïves area. Over 200,000 people were left homeless and an estimated 3,006 fatalities occurred. In the Bahamas, communications were disrupted and some homes were inundated by storm surge in the Abaco Islands. Similar impact was reported on Grand Bahama, with several houses and the airport being flooded. Further, winds tore-off and damaged a number of roofs. Throughout the state of Florida, strong winds were observed, leaving approximately 3.44 million people without electricity. Additionally, more than 101,611 homes were impacted by the storm, almost 14,000 of which severely or beyond repairs. Several other states experienced severe flooding. Overall, there were five deaths and about $7.5 billion in damage in the United States. A tropical wave developed into Tropical Depression Twelve early on September 16, while located 390 mi (630 km) southwest of Cape Verde. The depression moved westward under a subtropical ridge and became Tropical Storm Karl later that day. On September 17, the storm curved northwestward and continued strengthening, reaching hurricane status early on September 18. Karl intensified significantly while moving west to west-northwestward and became a major hurricane by early the next day. 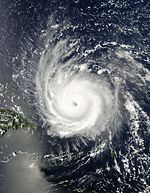 The storm briefly deepened to a Category 4 hurricane on September 20, before weakening slightly and subsequently re-strengthening to that intensity. With a steadily increasing wind field, Karl peaked with maximum sustained winds of 145 mph (230 km/h) early on September 21 while resuming a northwestward motion. After peak intensity on September 21, Karl weakened due to increasing wind shear, while moving northeastward in response to a baroclinic trough. After wind shear lessened, the storm briefly became a major hurricane again on September 23. However, wind shear returned later that day and ocean temperatures began cooling. Another trough re-curved Karl northward on September 24 as the storm was gradually weakening. Early on September 25, Karl became extratropical while located about 585 mi (940 km) east of Cape Race, Newfoundland. The remnants of Karl accelerated northeastward and then east-northeastward. Sustained winds up to 89 mph (143 km/h) and gusts reaching 112 mph (180 km/h) were observed on Mykines in the Faroe Islands. The extratropical remnants of Karl dissipated over Norway on September 28. At 18:00 UTC on September 19, a tropical wave developed into Tropical Depression Thirteen, which was centered located about 520 mi (840 km) west-southwest of Cape Verde. Despite unfavorable conditions due to outflow from nearby Hurricane Karl, the depression strengthened into Tropical Storm Lisa on September 20. After nearly reaching hurricane status, Lisa began executing a small cyclonic loop due to a Fujiwhara interaction with a tropical wave. Additionally, the interaction caused Lisa to weaken to a tropical depression on September 23. As Lisa merged with the tropical wave, convection became difficult to distinguish between the two systems, although Lisa maintained a distinct low-level circulation throughout the merger. During the next several days, the storm fluctuated in intensity, from a tropical depression to a strong tropical storm. A deep mid- to upper-level trough caused Lisa to turn northward on September 25. By October 1, a short-wave trough re-curved and accelerated Lisa toward the northeast. The storm strengthened and was finally upgraded to a hurricane at 06:00 UTC on October 2. At that time, Lisa attained its peak intensity with winds of 75 mph (120 km/h) and a minimum barometric pressure of 987 mbar (29.1 inHg). After sea surface temperatures dropped to around 73.4 °F (23.0 °C), Lisa weakened and was downgraded to a tropical storm later on October 2. The storm lost tropical characteristics and transitioned into an extratropical cyclone at 12:00 UTC on October 3. Shortly thereafter, the remnants of Lisa were absorbed by a frontal zone while located about 1,150 mi (1,850 km) of Cape Race, Newfoundland. A tropical wave developed into Tropical Depression Fourteen on October 8, while located about 205 mi (330 km) southeast of Brownsville, Texas. The depression strengthened into Tropical Storm Matthew about six hours later. The storm moved generally northeastward or northward throughout its duration. After briefly weakening, Matthew attained its peak intensity late on October 9, with maximum sustained winds of 45 mph (75 km/h) and a minimum barometric pressure of 997 mbar (29.4 inHg). At 11:00 UTC on October 10, Matthew made landfall near Cocodrie, Louisiana with winds of 40 mph (65 km/h). Only an hour later, Matthew weakened to a tropical depression and became extratropical early on October 11. The storm dropped heavy rainfall in southeastern Louisiana, with a peak total of 18 in (460 mm) near Haynesville. Along the coast, storm surge up to 5.85 ft (1.78 m) was observed at Frenier. A combination of storm surge and heavy rainfall inundated numerous roads in Lafourche, Orleans, St. Bernard, St. John the Baptist, St. Tammany, and Terrebonne parishes. About 20 homes in Terrebonne Parish were damaged, while several others were flooded in Lafourche Parish. A tornado also damaged the roof of a trailer in Golden Meadow. Winds resulted in electrical outages for approximately 2,500 customers. The storm cracked water lines in LaPlace, leaving nearly 30,000 residents without tap water. Overall, losses in Louisiana reached $255,000. In Mississippi, storm surge caused coastal flooding in Hancock County. Damage in the state totaled only $50,000. The interaction between an upper-level trough and a decaying cold front led to the development of a low pressure area on October 8 to the southwest of Bermuda. Although it lacked a well-defined center of circulation, the system was already producing gale-force winds. Early on October 10, the low developed a curved band of convection northwest of the center, and it organized into Subtropical Storm Nicole by 06:00 UTC. An approaching mid-level trough turned the system northeastward. Early on October 11, Nicole passed about 60 mi (95 km) northwest of Bermuda. On the island, Nicole and its precursor dropped 5.86 in (148 mm) of rainfall and produced wind gusts reaching 60 mph (97 km/h). The winds left 1,800 homes and businesses without power, while the unsettled conditions caused delays at the L.F. Wade International Airport. After passing Bermuda, Nicole developed an area of convection near the center, suggesting the beginning of a transition to a tropical cyclone. However, strong wind shear caused weakening after the storm reached peak winds of 50 mph (85 km/h), preventing Nicole's transition to a fully tropical cyclone. A larger extratropical storm absorbed Nicole on October 11, while the storm was located south of Nova Scotia. In Maine, gusty winds from the remnants of Nicole downed trees and electrical lines, resulting some power outages, especially along or near the coast. Similarly, 11,300 people were left without electricity in Prince Edward Island and New Brunswick alone after winds uprooted trees and toppled power lines. Significant rainfall was also produced in the region, peaking at about 5 in (130 mm) in northeastern Nova Scotia. A cold front and a strong upper-level trough interacted, resulting in the development of an extratropical low pressure area on November 26. After losing frontal characteristics, the system transitioned into Subtropical Storm Otto at 12:00 UTC on November 29, while located about 1,150 mi (1,850 km) east-southeast of Bermuda. Initially, the storm moved northwestward due to a weakness in a subtropical ridge. Late on November 29, Otto attained its maximum sustained wind speed of 50 mph (85 km/h). Deep convection formed near the center and the storm began transitioning to a warm core system. The system was re-classified as Tropical Storm Otto at 12:00 UTC on November 30, although it is possible that Otto transitioned to a fully tropical cyclone one day earlier, on November 29. Although sea temperatures were relatively cold, Otto did not quickly weaken, because of low wind shear. On December 1, the storm curved southeastward and completed a cyclonic loop later that day. After wind shear began increasing, Otto started weakening and was downgraded to a tropical depression at 12:00 UTC on December 2. At that, Otto reached its minimum barometric pressure of 995 mbar (29.4 inHg). Early on December 3, the storm degenerated into a remnant low while located about 920 mi (1,480 km) southeast of Bermuda. The following table lists all of the storms that have formed in the 2004 Atlantic hurricane season. It includes their duration, names, landfall(s) (in parentheses), damages, and death totals. Deaths in parentheses are additional and indirect (an example of an indirect death would be a traffic accident), but were still related to that storm. Damage and deaths include totals while the storm was extratropical, a wave, or a low, and all of the damage figures are in 2004 USD. The following names were used for named storms that formed in the North Atlantic in 2004. This is the same list used for the 1998 season except for Gaston and Matthew, which replaced Georges and Mitch. The names not retired from this list were used again in 2010. Storms were named Gaston, Matthew, and Otto for the first time in 2004. Names that were not assigned are marked in gray. On April 5, 2005, The World Meteorological Organization retired four names – Charley, Frances, Ivan, and Jeanne due to extreme damages and death toll and will not be used again for an Atlantic hurricane. They were replaced in the 2010 season by Colin, Fiona, Igor, and Julia. The 2004 season is tied with the 1955, 1995, and 2017 seasons for the second-highest number of names retired after a single season in the Atlantic basin, surpassed only by the 2005 season, which had five names retired. ^ A major hurricane is a storm that ranks as Category 3 or higher on the Saffir–Simpson hurricane wind scale. ^ Saffir–Simpson Hurricane Wind Scale. National Hurricane Center (Report). Miami, Florida: National Oceanic and Atmospheric Administration. May 23, 2013. Retrieved April 18, 2014. ^ NOAA Reviews Record-Setting 2005 Atlantic Hurricane Season (Report). National Oceanic and Atmospheric Administration. April 13, 2006. Retrieved July 10, 2014. ^ Philip J. Klotzbach; William M. Gray (December 8, 2006). Extended Range Forecast of Atlantic Seasonal Hurricane Activity and U.S. Landfall Strike Probability for 2007 (Report). Fort Collins, Colorado: Colorado State University. Archived from the original on March 4, 2016. Retrieved July 10, 2014. ^ Background Information: The North Atlantic Hurricane Season. Climate Prediction Center (Report). College Park, Maryland: National Oceanic and Atmospheric Administration. August 9, 2012. Retrieved April 18, 2014. ^ William M. Gray; Philip J. Klotzbach (December 5, 2003). Extended Range Forecast of Atlantic Seasonal Hurricane Activity and US Landfall Strike Probability for 2004 (Report). Fort Collins, Colorado: Colorado State University. Archived from the original on May 2, 2013. Retrieved September 1, 2014. ^ William M. Gray; Philip J. Klotzbach (April 2, 2004). Extended Range Forecast of Atlantic Seasonal Hurricane Activity and US Landfall Strike Probability for 2004 (Report). Fort Collins, Colorado: Colorado State University. Archived from the original on July 20, 2008. Retrieved September 1, 2014. ^ Above-normal 2004 Atlantic Hurricane Season Predicted (Report). Silver Spring, Maryland: National Oceanic and Atmospheric Administration. May 17, 2004. Retrieved July 10, 2014. ^ William M. Gray; Philip J. Klotzbach (May 28, 2004). Extended Range Forecast of Atlantic Seasonal Hurricane Activity and US Landfall Strike Probability for 2004 (Report). Fort Collins, Colorado: Colorado State University. Archived from the original on May 1, 2006. Retrieved July 10, 2014. ^ William M. Gray; Philip J. Klotzbach (August 6, 2004). Extended Range Forecast of Atlantic Seasonal Hurricane Activity and US Landfall Strike Probability for 2004 (Report). Fort Collins, Colorado: Colorado State University. Archived from the original on July 14, 2014. Retrieved July 10, 2014. ^ a b c An Active 2004 Atlantic Hurricane Season Likely (Report). Silver Spring, Maryland: National Oceanic and Atmospheric Administration. August 10, 2004. Retrieved July 10, 2014. ^ William M. Gray; Philip J. Klotzbach (September 3, 2004). Forecast of Atlantic Hurricane Activity for September and October 2004 and Seasonal Update Through August (Report). Fort Collins, Colorado: Colorado State University. Retrieved September 1, 2014. ^ a b c d e f g James L. Franklin; Richard J. Pasch; Lixion A. Avila; John L. Beven II; Miles B. Lawrence; Stacy R. Stewart; Eric S. Blake (March 2006). Atlantic Hurricane Season of 2004 (PDF). Atlantic Oceanographic and Meteorological Laboratory; National Hurricane Center (Report). Miami, Florida: National Oceanic and Atmospheric Administration. Retrieved July 10, 2014. ^ William M. Gray; Philip J. Klotzbach (October 1, 2004). Forecast of Atlantic Hurricane Activity for September and October 2004 and Seasonal Update Through August (Report). Fort Collins, Colorado: Colorado State University. Retrieved September 1, 2014. ^ "NOAA Announces The Return Of El Niño". Silver Spring, Maryland: National Oceanic and Atmospheric Administration. September 10, 2004. Retrieved July 10, 2014. ^ a b c James L. Franklin; Richard J. Pasch; Lixion A. Avila; John L. Beven II; Miles B. Lawrence; Stacy R. Stewart; Eric S. Blake (March 2006). Atlantic Hurricane Season of 2004 (PDF). Atlantic Oceanographic and Meteorological Laboratory; National Hurricane Center (Report). Miami, Florida: National Oceanic and Atmospheric Administration. Retrieved July 10, 2014. William Angel. Storm Data and Unusual Weather Phenomena (PDF). National Hurricane Center (Report). Asheville, North Carolina: National Oceanic and Atmospheric Administration. Archived from the original (PDF) on July 7, 2014. Retrieved July 10, 2014. 2004-Bonnie (Report). Moncton, New Brunswick: Environment Canada. September 14, 2010. Retrieved July 10, 2014. Twenty-seventh Hurricane Committee (PDF) (Report). World Meteorological Organization. 2005. Archived from the original (PDF) on November 27, 2012. Retrieved July 10, 2014. William A. Messina, Jr. (2004). An Assessment of Hurricane Charley's Impact on Cuba (Report). Gainesville, Florida: University of Florida. Retrieved July 10, 2014. Eric S. Blake, Christopher W. Landsea; Ethan J. Gibney (August 2011). The Deadliest, Costliest, And Most Intense United States Tropical Cyclones From 1851 To 2010 (And Other Frequently Requested Hurricane Facts) (PDF). National Hurricane Center (Report). Miami, Florida: National Oceanic and Atmospheric Administration. Retrieved July 10, 2014. Aurelia Zanetti; Susanna Schwarz and Rudolf Enz (2005). Natural Catastrophes and man-made disasters in 2004 (PDF) (Report). Zurich, Switzerland: Swiss Re. Archived (PDF) from the original on February 2, 2013. Retrieved November 15, 2012. John L. Beven II (December 17, 2004). Tropical Cyclone Report: Hurricane Frances (PDF). National Hurricane Center (Report). Miami, Florida: National Oceanic and Atmospheric Administration. Retrieved January 11, 2015. Guy Carpenter (September 17, 2004). Hurricanes Charley, Frances, Ivan & Jeanne Caribbean Impact (PDF) (Report). Guy Carpenter & Company. Archived from the original (PDF) on November 3, 2006. Retrieved April 8, 2007. James L. Franklin, Daniel P. Brown; Colin McAdie (February 16, 2005). Tropical Cyclone Report: Hurricane Gaston (PDF). National Hurricane Center (Report). Miami, Florida: National Oceanic and Atmospheric Administration. Retrieved July 10, 2014. Stacy R. Stewart (May 27, 2005). Tropical Cyclone Report: Hurricane Ivan (PDF). National Hurricane Center (Report). Miami, Florida: National Oceanic and Atmospheric Administration. Retrieved January 11, 2015. 2004-Ivan (Report). Moncton, New Brunswick: Environment Canada. October 27, 2010. Retrieved September 1, 2014. Miles B. Lawrence; Hugh Cobb (September 8, 2014). Tropical Cyclone Report: Hurricane Jeanne (PDF). National Hurricane Center (Report). Miami, Florida: National Oceanic and Atmospheric Administration. Retrieved January 25, 2015. Hurricane Relief (Report). Washington, D.C.: United States Agency for International Development. October 14, 2004. Archived from the original on October 15, 2004. Retrieved August 29, 2014. William Angel. Storm Data and Unusual Weather Phenomena (PDF). National Climatic Data Center (Report). Asheville, North Carolina: National Oceanic and Atmospheric Administration. Archived from the original (PDF) on July 8, 2014. Retrieved July 8, 2014. ^ a b Aurelia Zanetti; Susanna Schwarz and Rudolf Enz (2005). Natural Catastrophes and man-made disasters in 2004 (PDF) (Report). Zurich, Switzerland: Swiss Re. Archived (PDF) from the original on February 2, 2013. Retrieved November 15, 2012. ^ "Hurricane Alex Heads Out To Sea". CNN. August 4, 2004. Archived from the original on August 6, 2004. Retrieved July 10, 2014. ^ Monthly Tropical Weather Summary. National Hurricane Center (Report). Miami, Florida: National Oceanic and Atmospheric Administration. September 1, 2004. Retrieved July 10, 2014. ^ Monthly Tropical Weather Summary. National Hurricane Center (Report). Miami, Florida: National Oceanic and Atmospheric Administration. September 1, 2012. Retrieved July 10, 2014. ^ a b c d e f Eric S. Blake; Christopher W. Landsea; Ethan J. Gibney (August 2011). The Deadliest, Costliest, And Most Intense United States Tropical Cyclones From 1851 To 2010 (And Other Frequently Requested Hurricane Facts) (PDF). National Hurricane Center (Report). Miami, Florida: National Oceanic and Atmospheric Administration. Retrieved July 10, 2014. ^ State of the Climate Global Hazards May 2004. National Climatic Data Center (Report). Asheville, North Carolina: National Oceanic and Atmospheric Administration. 2004. Archived from the original on March 3, 2016. Retrieved February 18, 2010. ^ a b Atlantic basin Comparison of Original and Revised HURDAT. Hurricane Research Division; Atlantic Oceanographic and Meteorological Laboratory (Report). Miami, Florida: National Oceanic and Atmospheric Administration. February 2014. Retrieved July 10, 2014. ^ NOAA Provides Wrap-up On Very Active 2004 Atlantic Hurricane Season (Report). Silver Spring, Maryland: National Oceanic and Atmospheric Administration. November 30, 2004. Retrieved July 10, 2014. ^ a b c d James L. Franklin (October 26, 2004). Tropical Cyclone Report: Hurricane Alex (PDF). National Hurricane Center (Report). Miami, Florida: National Oceanic and Atmospheric Administration. Retrieved January 11, 2015. ^ a b c d e f Stacy R. Stewart (May 27, 2005). Tropical Cyclone Report: Hurricane Ivan (PDF). National Hurricane Center (Report). Miami, Florida: National Oceanic and Atmospheric Administration. Retrieved January 11, 2015. ^ Paul Simons; Alan Hamilton (June 15, 2005). "The ten-storey Mexican wave". The Times. London, England. Archived from the original on June 17, 2005. Retrieved May 4, 2010. ^ William M. Gray; Philip J. Klotzbach (November 18, 2005). Summary of 2005 Atlantic Tropical Cyclone and Verification (Report). Fort Collins, Colorado: Colorado State University. Archived from the original on August 9, 2014. Retrieved August 31, 2014. ^ "Hurricane Alex leaving thousands in the dark". Hatteras, North Carolina. Associated Press. August 3, 2004. Archived from the original on May 22, 2006. Retrieved May 22, 2006. ^ a b John Cole; Richard Bandy (August 6, 2004). Hurricane Alex Impacts Eastern North Carolina. National Weather Service Office in Newport/Morehead City, North Carolina (Report). Newport, North Carolina: National Oceanic and Atmospheric Administration. Retrieved July 10, 2014. ^ a b c d e f g William Angel. Storm Data and Unusual Weather Phenomena (PDF). National Hurricane Center (Report). Asheville, North Carolina: National Oceanic and Atmospheric Administration. Archived from the original (PDF) on July 7, 2014. Retrieved July 10, 2014. ^ Lixion A. Avila (October 5, 2004). Tropical Cyclone Report: Tropical Storm Bonnie (PDF) (Report). Miami, Florida: National Hurricane Center. Retrieved January 11, 2014. ^ Airport in St Vincent temporarily closed due to flooding. National Emergency Office, St Vincent (Report). Caribbean Disaster Emergency Management Agency. August 4, 2004. Archived from the original on September 28, 2007. Retrieved May 18, 2006. ^ (in Spanish) Tormenta Tropical "Bonnie" (PDF) (Report). Mexican Navy. Archived from the original (PDF) on January 16, 2016. Retrieved July 10, 2014. ^ Brett Witt (August 13, 2004). "Bonnie brings high winds, tornadoes around SC". WIS. Columbia, South Carolina. Associated Press. Archived from the original on February 4, 2012. Retrieved July 10, 2014. ^ 2004-Bonnie (Report). Moncton, New Brunswick: Environment Canada. September 14, 2010. Retrieved July 10, 2014. ^ Richard J. Pasch; Daniel P. Brown; Eric S. Blake (September 15, 2011). Tropical Cyclone Report: Hurricane Charley (PDF). National Hurricane Center (Report). Miami, Florida: National Oceanic and Atmospheric Administration. Retrieved July 10, 2014. ^ Hurricane Charley Left Minimal Damage in Western Jamaica (Report). Kingston, Jamaica: Jamaica Information Service. August 12, 2004. Archived from the original on July 18, 2013. Retrieved August 24, 2009. ^ John Myers Jr.; Erica James-King (August 13, 2004). "Charley wreaks havoc on homes". The Jamaica Gleaner. Archived from the original on 2012-06-12. Retrieved July 10, 2014. ^ a b c d e f g h Twenty-seventh Hurricane Committee (PDF) (Report). World Meteorological Organization. 2005. Archived from the original (PDF) on November 27, 2012. Retrieved July 10, 2014. ^ a b William A. Messina, Jr. (2004). An Assessment of Hurricane Charley's Impact on Cuba (Report). Gainesville, Florida: University of Florida. Retrieved July 10, 2014. ^ Hurricane Charley Situation Report (PDF). Office of Energy Assurance (Report). Washington, D.C.: United States Department of Energy. August 14, 2004. Retrieved July 10, 2014. ^ 2004-Charley (Report). Moncton, New Brunswick: Environment Canada. September 14, 2010. Retrieved July 10, 2014. ^ a b c Stacy R. Stewart (November 19, 2004). Tropical Cyclone Report: Hurricane Danielle (PDF). National Hurricane Center (Report). Miami, Florida: National Oceanic and Atmospheric Administration. Retrieved January 11, 2015. ^ Stacy R. Stewart (August 13, 2004). Tropical Depression Four Discussion 2. National Hurricane Center (Report). Miami, Florida: National Oceanic and Atmospheric Administration. Retrieved July 10, 2014. ^ a b Miles B. Lawrence (November 24, 2004). Tropical Cyclone Report: Tropical Storm Earl (PDF) (Report). Miami, Florida: National Hurricane Center. Retrieved January 11, 2015. ^ a b "Tropical Storm Earl Report". Grenada Today. August 28, 2004. Archived from the original on 2014-10-20. Retrieved July 10, 2014. ^ Loren Brown (August 16, 2004). "Tropical Storm Earl Hits Caribbean Isles". HighBeam Research. St. Georges, Grenada. Associated Press. Archived from the original on October 25, 2012. Retrieved July 10, 2014. ^ "Keep an eye on Tropical Storm Earl". Jamaica Observer. Associated Press. August 16, 2004. Archived from the original on September 26, 2007. Retrieved June 6, 2009. ^ a b c d John L. Beven II (December 17, 2004). Tropical Cyclone Report: Hurricane Frances (PDF). National Hurricane Center (Report). Miami, Florida: National Oceanic and Atmospheric Administration. Retrieved January 11, 2015. ^ John C Rodgers III; Douglas W. Gamble (July–September 2008). "The impact of Hurricane Frances (2004) on the invasive Australian pine (Casuarina equisetifolia L.) on San Salvador Island, The Bahamas". Journal of the Torrey Botanical Society. Mississippi State University and University of North Carolina. 135 (3). ISSN 1940-0616. ^ Joseph B. Treaster. "Hurricane Frances: The Bahamas: Damage Is Mostly Light as Storm Pelts Island Chain". The New York Times. Retrieved July 10, 2014. ^ Guy Carpenter (September 17, 2004). Hurricanes Charley, Frances, Ivan & Jeanne Caribbean Impact (PDF) (Report). Guy Carpenter & Company. Archived from the original (PDF) on November 3, 2006. Retrieved April 8, 2007. ^ Communication to Parliament on Hurricane Frances and an addendum report on Hurricane Jeanne by the Rt. Hon. Perry G. Christie, Prime Minister and Minister of Finance (Report). Ministry of Foreign Affairs. October 6, 2004. Archived from the original on October 26, 2007. Retrieved April 6, 2009. ^ John Marquis (September 7, 2004). Frances leaves deep scars on battered Bahamas. Reuters (Report). Nassau, Bahamas: ReliefWeb. Retrieved July 10, 2014. ^ a b c d e f g h William Angel. Storm Data and Unusual Weather Phenomena (PDF). National Climatic Data Center (Report). Asheville, North Carolina: National Oceanic and Atmospheric Administration. Archived from the original (PDF) on July 8, 2014. Retrieved July 10, 2014. ^ Hurricane Frances: September 5, 2004. National Weather Service Office Miami, Florida (Report). Miami, Florida: National Oceanic and Atmospheric Administration. April 8, 2010. Retrieved July 10, 2014. ^ a b Florida State’s Energy Emergency Response to the 2004 Hurricanes (PDF). Office of Energy Assurance (Report). Washington, D.C.: United States Department of Energy. June 2005. Retrieved July 10, 2014. ^ a b c d e James L. Franklin; Daniel P. Brown; Colin McAdie (February 16, 2005). Tropical Cyclone Report: Hurricane Gaston (PDF). National Hurricane Center (Report). Miami, Florida: National Oceanic and Atmospheric Administration. Retrieved January 11, 2015. ^ "Gaston Recap". The Palm Beach Post. September 2004. Archived from the original on March 9, 2005. Retrieved July 10, 2014. ^ 2004-Gaston (Report). Environment Canada. September 14, 2010. Retrieved July 10, 2014. ^ a b c d Lixion A. Avila (October 20, 2004). Tropical Cyclone Report: Tropical Storm Hermine (PDF). National Hurricane Center (Report). Miami, Florida: National Oceanic and Atmospheric Administration. Retrieved January 11, 2015. ^ Lixion A. Avila (August 29, 2004). Tropical Storm Hermine Discussion Number 1. National Hurricane Center (Report). Miami, Florida: National Oceanic and Atmospheric Administration. Retrieved July 10, 2014. ^ Brian R. Jarvinen (August 30, 2004). Tropical Storm Hermine Discussion Number 3. National Hurricane Center (Report). Miami, Florida: National Oceanic and Atmospheric Administration. Retrieved July 10, 2014. ^ Miles B. Lawrence (August 30, 2004). Tropical Storm Hermine Discussion Number 4. National Hurricane Center (Report). Miami, Florida: National Oceanic and Atmospheric Administration. Retrieved July 10, 2014. ^ 2004-Hermine (Report). Moncton, New Brunswick: Environment Canada. September 14, 2010. Retrieved July 10, 2014. ^ Carol Williams; John-Thor Dahlburg (June 12, 2005). "Arlene Trace's Hurricane Ivan's Route". Los Angeles Times. Mobile, Alabama. The Nation. Retrieved July 10, 2014. ^ Andrew I. Watson; Michael A. Jamski; T.J. Turnage; Joshua R. Bowen; Jason C. Kelley (2005). The Tornado Outbreak across the North Florida Panhandle in association with Hurricane Ivan (PDF). National Weather Service office in Tallahassee, Florida (Report). American Meteorological Society. Retrieved August 28, 2014. ^ 2004-Ivan (Report). Moncton, New Brunswick: Environment Canada. October 27, 2010. Retrieved July 10, 2014. ^ Richard J. Pasch (November 21, 2004). Tropical Cyclone Report: Tropical Depression Ten (PDF). National Hurricane Center (Report). Miami, Florida: National Oceanic and Atmospheric Administration. Retrieved January 25, 2015. ^ a b c Miles B. Lawrence; Hugh Cobb (September 8, 2014). Tropical Cyclone Report: Hurricane Jeanne (PDF). National Hurricane Center (Report). Miami, Florida: National Oceanic and Atmospheric Administration. Retrieved January 25, 2015. ^ "Lourd bilan des intempéries" (in French). MAXImini.com. September 17, 2004. Archived from the original on October 15, 2014. Retrieved August 29, 2014. ^ "Hurricane Relief". Washington, D.C.: United States Agency for International Development. October 14, 2004. Archived from the original on October 15, 2004. Retrieved August 29, 2014. ^ Bahamas: Hurricane Jeanne Appeal No. 23/04 Operations Update No. 2. International Federation of Red Cross and Red Crescent Societies (Report). ReliefWeb. January 5, 2005. Retrieved August 29, 2014. ^ Hagemeyer, et at. (March 19, 2010). Hurricane Jeanne. National Weather Service Melbourne, Florida (Report). Melbourne, Florida: National Oceanic and Atmospheric Administration. Retrieved August 29, 2014. ^ a b c d Jack L. Beven (December 17, 2004). Tropical Cyclone Report: Hurricane Karl (PDF). National Hurricane Center (Report). Miami, Florida: National Oceanic and Atmospheric Administration. Retrieved July 10, 2014. ^ Eric S. Blake; Richard J. Pasch (September 22, 2004). Hurricane Karl Discussion Number 23. National Hurricane Center (Report). Miami, Florida: National Oceanic and Atmospheric Administration. Retrieved July 10, 2014. ^ Robbie A. Berg; Lixion A. Avila (September 22, 2004). Hurricane Karl Discussion Number 26. National Hurricane Center (Report). Miami, Florida: National Oceanic and Atmospheric Administration. Retrieved July 10, 2014. ^ Miles B. Lawrence (September 23, 2004). Hurricane Karl Discussion Number 29. National Hurricane Center (Report). Miami, Florida: National Oceanic and Atmospheric Administration. Retrieved July 10, 2014. ^ (in Danish) Bjarne Siewertsen (September 27, 2004). Karl blæste på Færøerne (Report). Copenhagen, Denmark: Danish Meteorological Institute. Archived from the original on October 10, 2006. Retrieved November 15, 2012. ^ a b c James L. Franklin; David P. Roberts (November 10, 2004). Tropical Cyclone Report: Hurricane Lisa (PDF). National Hurricane Center (Report). Miami, Florida: National Oceanic and Atmospheric Administration. Retrieved January 28, 2015. ^ a b Lixion A. Avila (October 27, 2004). Tropical Cyclone Report: Tropical Storm Matthew (PDF). National Hurricane Center (Report). Miami, Florida: National Oceanic and Atmospheric Administration. Retrieved January 28, 2015. ^ a b c William Angel. Storm Data and Unusual Weather Phenomena (PDF). National Climatic Data Center (Report). Asheville, North Carolina: National Oceanic and Atmospheric Administration. Archived from the original (PDF) on July 8, 2014. Retrieved July 8, 2014. ^ Susan Finch; Aesha Rasheed (October 11, 2004). "Matthew Floods Roads, Homes". The Times-Picayune. Lafayette, Louisiana: Governor's Office of Homeland Security and Emergency Preparedness. Archived from the original on February 18, 2005. Retrieved July 10, 2014. ^ a b c d Richard J. Pasch; David P. Roberts (December 9, 2004). Tropical Cyclone Report: Subtropical Storm Nicole (PDF). National Hurricane Center (Report). Miami, Florida: National Oceanic and Atmospheric Administration. Retrieved January 28, 2015. ^ Weather Summary for October 2004 (Report). Hamilton, Bermuda: Bermuda Weather Service. November 1, 2004. Archived from the original on July 18, 2011. Retrieved October 11, 2006. ^ Sarah Titterton; Eloisa Mayers (October 11, 2004). "Nicole drowns out the music". The Royal Gazette. Retrieved July 10, 2014. ^ Jack L. Beven (October 11, 2004). Subtropical Storm Nicole Discussion 5 (Report). Miami, Florida: National Hurricane Center. Retrieved July 10, 2014. ^ 2004-Nicole (Report). Moncton, New Brunswick: Environment Canada. September 14, 2010. Retrieved July 10, 2014. ^ a b c Stacy R. Stewart (December 7, 2004). Tropical Cyclone Report: Tropical Storm Otto (PDF). National Hurricane Center (Report). Miami, Florida: National Oceanic and Atmospheric Administration. Retrieved January 28, 2015. ^ Worldwide Tropical Cyclone Names. National Hurricane Center (Report). Miami, Florida: National Oceanic and Atmospheric Administration. January 9, 2004. Archived from the original on February 2, 2004. Retrieved August 28, 2014. ^ Tropical Cyclone Naming History and Retired Names. National Hurricane Center (Report). Miami, Florida: National Oceanic and Atmospheric Administration. April 10, 2014. Retrieved August 28, 2014. 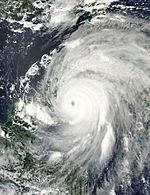 Wikimedia Commons has media related to 2004 Atlantic hurricane season.